The accesspries attached to the engine are more difficult to get to naturally. But you'll like the power. I get 17 mpg around town, 20 highway. It'll put a smile on your face compared to the anemic 525. Maintenance can be tedious but is manageable. The mileage yaofeng stated is pretty much right. Everyone's mileage will be a little different depending on how and where they drive. On my drive back from picking up my 540i I managed to get up to 28mpg through mountains. These cars definitely have grin factor 9! Mine gets about 16-17mpg on the daily comm...queue. 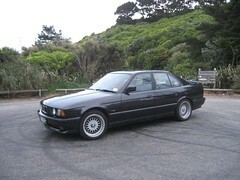 I am going to check out a 1995 540i 6 speed with 144,000 miles this weekend. Just curious, what kind of mpgs to expect. I have owned several 6 cylinder BMWs and always thought that the 8s were overkill, but this one looks really nice. Is maintenance a pain with the larger engine in the same size engine bay? I've got the 5 speed auto in mine, and get 17-19 around town (depending on how much I put the pedal to the floor), and around 25-26 on the freeway. I can tell you the 540(286hp/295 ft-lbs) is in a different league than the 535 (208hp/223 ft-lbs). No. I have not driven a 535. What I do know is my SAAB 9000 turbos will eat my 95 525's(189hp/184 ft-lbs) lunch anytime, anywhere. The SAAB 9000 turbo's has 200hp/240 ft-lbs. The 9000 gets the maximum torque at 1,800 rpm and it stays flat until 4,600 rpm. But you just cannot compare them to the 540. Unless the 540 you have driven has hoof disease. Let us know what you find out about the car. After I read you post I did my weekly review of CL and saw what you are going to look at. Looks nice! I would run to see that car. Black on grey leather. Looks great.